"If you have a good palate and oodles of patience, you can achieve amazing dishes with the right recipe. You must, however, follow the recipe". -Matt Preston. Preston is a very good food writer, despite being prone to the occasional lapse into encyclopaedic recitation of factoids. His unfortunately-titled book Cravat-a-Licious is an enjoyable read. However, I couldn't disagree more with his "rule" about recipes. In Cravat-a-Licious, Preston lists a number of "rules" that he thinks ought to guide home cooks. They're mostly fairly unobjectionable, if a tad patronising. The recipe rule, however, is pretty much offensive. Preston's silly rule tells us home cooks that the fundaments of cooking are beyond our feeble grasp; that our role is merely to reassemble pre-ordained dishes as if they were flat-packed furniture. It's also at odds with his rule #13, "cook from your heart". How can you "cook from your heart" if you're robotically, slavishly following a recipe? I started out highly recipe-dependent and completely scared of failure in the kitchen. Cooking, for me, was something I took up as a means to an end when I first moved out of home, the end being my slightly gluttonous love of eating. I soon found that I loved cooking for its own sake, but it took a while to learn when and how to veer away from the strictures of recipes, to substitute and improvise and even create dishes of my own: ie., to actually cook properly. Preston's rule tells us not to bother, that we're better being fearful of food and dutifully following a recipe, measuring out 125 grams of flour here and 15ml of olive oil there. He does backtrack a bit with rule #34: "if you are a good cook you don't have to follow a recipe word for word". What a generous concession to the abilities of home cooks. 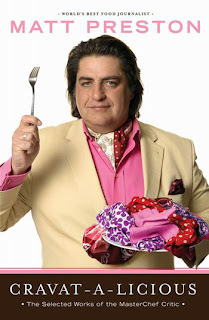 As I said at the start, I like Matt Preston. I didn't watch Masterchef, but I do think he's a good writer. I just find his attitude towards home cooks a bit patronising and dismissive, which is surprising from someone who often seems to value rustic "authenticity" over fiddly fine-dining. I haven't read this book so I can only comment on what you write. Well I think that the target market of this book is probably for novice cooks (ie: he is milking his Masterchef fame for what it's worth) and I guess a lot of homecooks are novices and like you I started out cooking being highly recipe dependent. If you are a novice cook and you follow a recipe to the dot, I don't see there being anyway to stuff it up unless you are dyslexic or something. The more you cook, the more you gain an understanding of food, what goes together and how it should be cooked etc. and then you start to take risks and don't need recipes anymore. Then I think you become more than a home cook, I think Preston acknowledges this a bit in rule #34. However, I think that what he says is contradicting in that on Masterchef they choose amauetuer chefs as contestants (mostly home cooks) and put them through all these challenges where they have to cook on the run without recipes.The judges will criticise dishes if it's too home cooked, and emphasise that they want some innovativeness and restaurant quality food. If the contestants on Masterchef followed his advice, the whole show might be a failure! Oh dear, I have to agree with you. Working up the confidence to deviate from a recipe or just come up with something from the dark recesses of your own brain (well, my brain has dark recesses, I don't want to be presumptive about yours) can produce much more exciting outcomes than strict recipe adherence. Without feeling free to go off on our own path, we'd be stuffed when finding ourselves unable to source a particular ingredient, or home from the grocery shopping with a packet of Fun Size Snickers but none of the tinned tomatoes we needed for dinner. Well said. I enjoy - or enjoyed - Preston's reviews, but the love has dimmed since he joined News Ltd. He lost me with a feature on avocados (when avos were diabolically hard to find) accompanied by a recipe for avocado on toast. I too haven't read the book in question, but subscribe firmly to the view that recipes only serve as the bare bones on which to base your use of your very vivid culinary imagination! With the benefit of my (40+) years in the kitchen, I look in my fridge and pantry, think rapidly through my harddrive-like memory for ideas on a similar dish which will complement what I see in front of me, then hop to it! I have probably only followed a recipe 10 times in my life of producing meals, every single night for family, and many days and nights commercially, and no real complaints have ensued. Cooking with love is the key I reckon! I am now teaching Year 11 & 12 secondary students cooking at school, and am, in my own subtle way, trying to pass on the beauties of following the recipe but allowing yourself free range on amending what you see in front of you, to make it relevant to your own personal tastes. Apex, Conor, injerarufus, Rita: I'm glad you all agree with me! My point isn't that recipes are useless or should be ignored, but that no one should feel scared when it comes to veering away from the recipe. (Apart from baking. I am not into baking). I couldn’t agree with you more. Recipes should never freak people out…this is a bad thing. But there are times when following a recipe is a very GOOD THING. That wasn’t my intention with any of these tips. Now what with you not watching the show it's understandable you wouldn’t have “got” and for clarity’s sake I should have concluded that tip with the words – “wouldn’t you agree Poh” or some such. But in spite of this you do raise some interesting debate about the role of the recipe and I'd like to argue that the humble recipe deserves a little more respect from us all. Yes, baking, in fact the whole world of the pasty chef – pastry, heat-proof ice cream, various gels and jellies, etc – can rely on recipes as complex as science formulae...as do the modernist recipes of the likes of Ferran Adria, Andoni Aduriz and Massimo Bottura which deals with techniques that very, very few of us are familiar. Not that many of us have immersion circulators or lime slaking baths at home! Even if these modernist chefs make it a matter of pride to share their recipes with their peers – and not hide them away so they can “own” these new techniques and other can only try and recreate them by trial and error. Of course cooking using your palate is often preferable given the inability of a recipe to reflect the myriad of variations that can occur dealing with natural ingredients and ranging climatic conditions. As well as the all too commom problem of recipes that are confusingly written or badly tested. It’s also a far more liberating way of cooking – assuming you don’t make any mis-steps. Fergus Henderson likens it to being a Jedi like and thus just feeling the force of how the vegetables are telling you to cut them when you braise pig’s tails. I love a good "fridge-shake" myself but when I started out cooking without recipes with all the over-confidence of an 18 year old I had a world of disasters "going it alone". Such as thinking blue mash potato might be fun, adding odd liqueurs to stews, and thinking that surely making hummus can't be that hard even without a recipe. It is experience and knowledge gives you the ability to fridge shake well. Luckily it sounds like you and your correspondents have already an unconscious handle on the sort of skills to make a success of your own creations in the kitchen and already see the ratio of flour to eggs in the perfect pasta, or the method to make a no-fail mayonnaise, or how and why to deglaze a pan as so ingrained they don’t need a recipe. This is a good think. But i suggest that the only reason there are now unconscious skills is because they all started out with a recipe - whether read, seen or passed on verbally from a friend – and aren’t they just following a recipe in their mind which they address until it looks and tastes “right”? Basically that recipe is “a friend in the kitchen” the first time you cook a dish...one whose success you might be able improvise without the recipe but few of us have the time (or the money for endless ingredients) to recreate a dishes thru the meticulous testing of alternative cooking processes and ingredient ratios/combinations based on what we have seen and tasted – without having the knowledge base that comes from recipe style information. If we want to create a dish that represents food from another cuisine we have never tasted in situ it helps immensely to read Diana Kennedy’s Mexican recipes, or Rose Gray’s Italian recipes. Sure you can then tweak the amount of cilantro or lime juice but a recipe will give you that stable jumping off point anchored in an expert’s years of experience shared in their recipe..
Sure, to create delicious NEW flavour combinations a recipe is your worst enemy because by definition if it's already been done. In that case recipe in books and online are only necessary to confirm that something hasn’t been done before. As regards the comment regarding the fact that MasterChef contestants are set Mystery Box and Invention Test challenges where no recipes are given as well as challenges where they must cook to a recipe there are solid reasons for this. It is because the majority of chefs in the professional kitchen must do every day – cook their head chefs creations to the head chef’s rules. Both style of challenges – no recipe and with recipe – are set so that we can look at two different skills sets at the stove. Anyway…thanks for your inspiration for what I think will work into a great column!!! You read the draft recipe here first!!! Mr Preston! Thanks for your comments. It seems as if it's actually you! I accept that you didn't intend to scare people off cooking. Apologies if my post made it seem as if I was attacking you, rather than the notion that we should always follow recipes. You're right; I wasn't aware of the MasterChef context. You're also right about the importance of recipes. I own far more cookbooks than a 27 year old with no assets or savings to his name should probably own. I have everything from River Cafe Easy (vale Rose Gray) to A Day at El Bulli, and each fills its little niche in my collection. Like most of us who are into food, I read recipes as others read short stories. I have plenty of respect for recipes. They are indeed our "friends in the kitchen". More important than recipes, though, are ratios and techniques. Recipes, if we instruct people to always follow them, can enslave us. You don't necessarily learn a lot if you're mechanically following a recipe. A ratio, on the other hand, sets you free. You mention pasta ratios and mayonnaise ratios; these are vital! Knowing these ratios, as you say, is vital to being able to go off-script and go it alone. We often have to read and follow recipes before we internalise the ratios. That doesn't mean we "must always follow the recipe". That just means that recipes (more accurately: ratios and techniques) are the necessary bedrock of any improvisation in the kitchen. I guess my post was informed by reading the entire Michael Ruhlman back catalogue. Ruhlman (despite being the co-author of a number of cookbooks including the entire Thomas Keller range) is a recipe sceptic. He thinks there are too many recipe books in the world, and that we're all too tied to our recipes. I think he's right. Ruhlman instead focuses on basic techniques (his book The Elements of Cooking sits alongside Jacques Pepin's Complete Technique on my shelf) and underlying ratios (his book Ratio was my favourite of 2009). In summary, I think we basically agree that some basic knowledge of ratios and techniques (the building blocks of any recipe) are necessary prerequisites to improvisation and creation. Any cook who has not yet acquired such knowledge should indeed stick to the recipe. This includes someone who is an accomplished cook but veering outside their comfort zone, like Poh and the chocolate. However, it's not true that we "must always stick to the recipe" once we have acquired a little bit of knowledge and skill. Veering away from the recipe can be one of the most rewarding acts in the kitchen. well said. i think that is ridiculous to undermine home cooks. but hey, i guess everyone's entitled to their opinions. in any case, thanks for the review! i never would've known. More posts content please! That is all. Ditto as per the Bank Holidays comment.... hope it's that Nat. More posts please.